You help your clients navigate today’s complex financial environment on a daily basis. But did you know that you’re in a unique position for teaching financial literacy to your clients’ children? According to a recent New York Times article, most states fall short when it comes to teaching high school students about personal finance. Citing the 2017 National Report Card compiled by Champlain College’s Center for Financial Literacy, only 5 states earned an A grade for their efforts to promote financial literacy, whereas 27 states received a C, D, or F. These numbers translate into hundreds of thousands of high schoolers who will go off to college without the tools to manage their budget—not to mention their student loan debt. It has the makings of a financial disaster of epic proportions. Download our free article to help clients devise a value-driven strategy for the transfer of wealth to future generations. 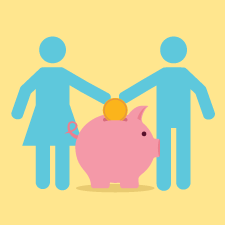 Encourage clients to be open about family finances. Have them discuss the family’s weekly, monthly, and annual spending habits. Advise parents to talk about how and why some things are bought on credit and others with cash. The money talk should also include short- and long-term financial goals, including the actions needed to achieve them (e.g., delaying gratification, spending less on discretionary items, saving more). To reinforce the money conversation, there are simple ways your clients can help their children develop good financial habits. Take children shopping, so they can start learning about spending, saving, and delaying gratification. Play counting games with coins and use piggy banks. Play board games that highlight financial decision-making. Introduce the Money Savvy Pig. It features individual slots for saving, spending, donating, and investing. Open a passbook savings account for children and discuss savings and compound interest. Remind your clients that it’s important to let kids withdraw some of their money to buy something they want, or they might lose interest in saving. How much? A good rule of thumb is $0.50 or $1 for every year of age. How often? A schedule (e.g., weekly or monthly) can help establish regular payments. How much should be saved, spent, donated, or invested? Set expectations from the start; each time the child is paid the allowance, parent and child should follow the agreed-upon process. Sit down with the teenager every month and go through the process of paying the credit card bill together. Show the teenager how to file a tax return if he or she is working. Plan with the teenager how to save over the long term for more expensive things (e.g., a car or college), and introduce investing for these purposes. If the teenager has a job, suggest that parents open a Roth or a traditional IRA. You might even consider hosting an investment club meeting for teens, where you discuss the pros and cons of investing in stocks and bonds and share your expertise. You could also bring in a speaker to promote sound money habits and provide tips for avoiding pitfalls in financial decision-making. Keep in mind that the most effective approaches are fun, hold kids’ attention, and allow them to practice making money decisions. Numerous books aim to promote financial literacy. Here are just a few that caught my eye. For kids. Money Savvy Generation (makers of the Money Savvy Pig mentioned above) has a couple of O.M.G. (i.e., Official Money Guide) books for teens and college students. About 50 pages long, these books offer concise chapters on topics like budgeting, managing debt, understanding identity theft, and donating to charity. For younger readers, When Times Are Tough by Yanitzia Canetti and the Pretty Penny series by Devon Kinch help kids develop a better relationship with money through creative, illustrated stories. Monopoly. Earning money, saving and spending, capital budgeting, risk and reward, expenses, and even taxes—Monopoly covers it all. Plus, new editions of the game translate financial lessons to today’s world. The Game of Life. In this game, players make life decisions that are tied to financial outcomes. Kids must choose a career (e.g., video game designer, secret agent), decide whether to buy or sell a house, and make other life decisions to see which ones produce the most wealth at the game’s end. Last but not least, the Internet is perhaps the biggest educational tool of our time. One of the best sites for teaching kids about money is Monetta, which offers interactive educational games (e.g., Math Madness, Financial Soccer) that balance investing, learning, and fun. The site also features a quarterly newsletter for kids and online quizzes. The Mint, a comprehensive money education site that includes sections for kids, teens, parents, and teachers. Launched in 1997, it helps users manage their money with the goal of securing a sound financial future. The Centsables, a financial literacy program for children that uses superheroes to make learning more fun. It features online games, a library of comic books, and a section for parents with tips for focusing on financial literacy at home. Quest to Clean Up, an app that encourages careful spending, teaching kids the value of saving their money for items they really want. GreenStreet, an app featuring game play to help kids with setting goals, budgeting, earning money, and giving to charity. Players can rescue endangered animals, but they must budget accordingly to buy food, shelter, and toys along the way. Oink, a mobile payment app designed for children ages 8 to 17. The platform helps kids manage their allowance, earn money for doing household chores, and more, while keeping parents involved in the process. By offering financial education services, you can both encourage clients to discuss basic money topics with their children and show that you genuinely care about their family’s financial well-being. Plus, as these children grow up and the transfer of wealth comes into play, they may be more likely to turn to you for continued counsel if you’ve already made a positive impact on their financial lives. Do you offer financial education services in your practice? What other resources have you found to be most effective with a younger audience? Please share your thoughts with us below! Editor's Note: This post was originally published in August 2016, but we've updated it to bring you more relevant and timely information.